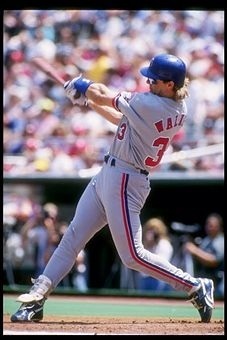 Larry Walker with the Expos. I was only a little 8-year-old at the time of the 1994 strike. I wasn’t fully engaged in baseball at the time and I don’t even remember anything about it. But as the years went on and when I started to fall in love with the sport, I continued to want to learn more about the history of the game. One thing that always comes to me are the what ifs in sports and the biggest one I can think of is the 1994 Montreal Expos. The strike in 1994 ended the season prematurely and the entire postseason was canceled. At the time, the Expos were in first place and some believed they had what it took to be champions. But the season never played out and the team was essentially dismantled afterward. Fans in Montreal still wonder to this day what would have happened if the 1994 season had played out. Would they have won? Could they have formed a dynasty? It’s hard to say. But it was 10 years after the strike that the Expos moved to Washington DC and the team was gone forever. It’s amazing that the city would embrace this reunion. Twenty years later after the devastating strike, the team is reaching back to its painful past to find any glory left in their memories. Maybe to them, this was the best they could ever achieve. Baseball is gone but for one night, they can pretend it’s 1994 again and be champions. But for some fans, this is a chance for them to show the world that Montreal can have a baseball team again. The perception to some, like me, who don’t know enough about the Expos is that the fanbase wasn’t strong. But it wasn’t just that. There was a lot of change in regime and it ultimately was just a floating team with no direction. I do wonder though if there was full support behind it, would Montreal ever see a team again? Of course with the way things are set up in baseball, that is unlikely. But this one night will remind us that at one point, it was thriving and baseball was king of Montreal. It’s sad that this team never got a chance to taste glory. Their magical season was abruptly stopped and what could have been was never realized. I applaud everyone putting this back together. This is a chance for the fans in Montreal to relive the joy of what it was like in 1994. And for everyone else, it’s a celebration of something special. This entry was posted in MLB, Montreal Expos, Washington Nationals and tagged Reunion. Bookmark the permalink.